When you’ve bought home your lovely new bundle of joy and have got over the first few months of sleepless nights and the mountain of laundry, it’s time to think about childproofing. From the age of 4 months babies can show signs of rolling over which is the first stages of crawling. Once they actually start to crawl around the 7th month mark, you will soon long for the days of putting your child down and them being where you left them. Preparing your home for this stage of childhood is vital for your own peace of mind and for your child’s physical development. The EYFS framework is used by all childcare professionals from Childminders to school teachers and shows how to engage with a child with the aim of promoting that child’s learning. Risk assessment is a large part of life with a child and the EYFS feels a child’s experiences should be as real as possible. So how do you make a child’s environment safe for them to explore without making it an alternative reality? On the market there are childproofing kits which usually include everything you need to get the basics secure for your little wanderer. The first thing you need to bear in mind when choosing an appropriate kit is the length of time you will need these safety devices for. 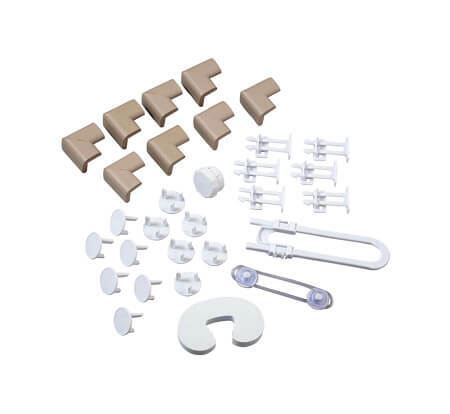 There are various types of kits which contain electrical socket covers and cupboard and drawer locks, parents usually go for the standard pack you can buy from any local store. The most important thing to remember is, these kits need to be fitted correctly or they are not worth the money you paid. There are some drawer locks that required you to open the drawer and insert your hand, the chances are your child will be able to get their hands in as they get older and potentially get them trapped. Therefore you may find the magnetic locks are the way to go. Once a child starts to pull up and stand which can be as early as 9 months, it creates a whole new threat level in your home. Children go from crawling to standing in the blink of an eye, so it’s easier to child-proof now before they gain new skills, agility and curiosity. Children love to be on their feet and find great pleasure in running, climbing so door safety is most important at this age. 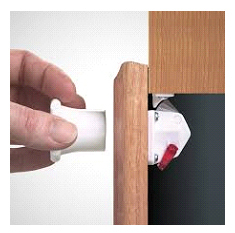 Little fingers will potentially get caught in a doors resulting in a very upsetting experience for both parent and child and in some cases a trip to A& E. So foam door stops are an excellent idea. Another real risk at this age is and exploring child opening a door and escaping from the safety of their own home. I have heard several mothers say they have picked up the phone and turned around to find their child is not in the house. The dread that goes through a parents mind when they cannot find their child is beyond anything you will ever feel, but in your own home where you think they are safe it is even worse. Locking your front door with a key when you are in is not advisable due to fire safety and many children can turn keys in locks from about 2 years old as my mum found out luckily only getting locked in the back garden. My front door has a sash jammer fitted which stops the door being opened unless you can push the lock up. This has been a huge help when I am busy and my helpful child goes to answer the door to a delivery man. Luckily I have never had that sinking feeling of where is my child as they are always in the house somewhere and can’t get out. 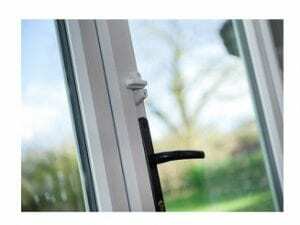 These kind of locks can be fitted to most doors and windows which makes them a great option as they will last for many years at least until the child is tall enough and old enough to reach the lock. These are just a few of the safety measures you will need for your growing child and hopefully you won’t feel like you are living in Fort Knox. 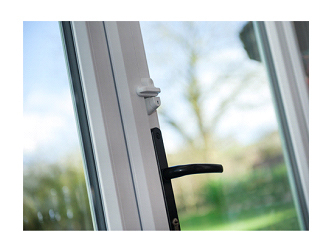 If you require a locksmith to come and fit any childproofing products to your home give us a call on 0800 035 0451 and one of our local mobile locksmiths will be more than happy to help.